Carmazzi is the founder of The Directive Communication Psychology, a leadership-training method built on observed group dynamics and responses. Ranked by Global Gurus as one of the top 10 most influential Leadership Gurus, Carmazzi is tremendously passionate about the role leadership plays in establishing company culture. In leadership, having a vision goes closely with being passionate about what you do. By focusing on individual points for improvement, and looking for the best in any given situation, we not only improve ourselves, but inspire people around us. And voila, the true successful leader is born. That starts with leaders themselves learning to find—and to build on—their existing strengths. Good leadership isn’t about wearing a mask or fitting into a mold, Carmazzi points out. It’s about becoming the best of who you already are. To learn more about how you can discover the best in yourself, watch today’s episode, and don’t forget to share it around and spread the passion. Moustafa: Hello everyone and welcome back to Passion Sundays, the best way to end the week and start another. Our guest today is ranked as one of the Top 10 Leadership coaches. And he’s got a phenomenal Directive Psychology Institute that he’s gonna tell us all about. Arthur, thank you very much for being here today. Arthur: My pleasure Moustafa! It’s really great being here. Moustafa: Being able to talk to one of the world’s best leadership coaches is an awesome thing. Moustafa: First question is – what does passion mean to you? Arthur: Passion…Okay, this is, this is my version of passion. Passion stems from the belief that in the process of doing something you can be more of who you want to be while being who you are. Okay? Which basically means that, the, anything that you do that gives you that potential of being more, creates passion. Moustafa: I love it! Awesome! And ah how does passion relate to leadership? Arthur: Well, okay let me hear, let me ask you a question. If, if you are in a situation where your boss is always like this…Okay? And there is no excitement, there’s no passion, there’s no bigger, grand picture, there’s no…es-essential, there’s no purpose that you see in the distance. Nothing greater…are you gonna be motivated? Arthur: Are you going to be engaged? Arthur: Okay? Then, well, you’re gonna be less engaged and you’re not gonna be very excited and you’re gonna be, and even if you are, if you have amazing skills, even if you have incredible potential if you are not in that kind of environment, you will be an underachiever. Moustafa: It’s easy when it’s easy but when going is going tough how do you actually find passion? Arthur: See that’s the whole thing about focus right? Okay I mean, okay, let me, let me just give you, give you one thing. Okay, first of all, when you focus on something, you notice the things you’re focusing on, you say “Oh my gosh! The economy is so difficult! Everything is so difficult! The people, you know, are, are not engaged, and people don’t want to show up for work!” Nye, nye,nye, nye, nye, nye! You focus on this stuff! And guess what! You’ll gonna get, you’ll gonna see all of that and you’ll gonna delete all of the other things. All of the potential great things! You know, just like when, let’s say for example, you’re working, you’re kind of going on and you’re doing everything perfectly for three months and then you make one mistake. Arthur: And then suddenly, nobody remembers what you’ve been doing for the past few things. Just that one mistake. Ye, ye, ye! And suddenly everything that you have built up, that momentum, that excitement, and everything else just… bam! Okay? And you lose your passion because the people around you are now focusing on what you are not doing or what you’re doing wrong instead of what you have done or what you have the potential to achieve. So environment and the leadership ability to focus, to help people focus on how they can be valued. How they can move past mistakes, how they can be excellent, how they can bring the best of who they are and even if they make mistakes, how they can use those mistakes to improve their competencies. That is when you develop an organization that has passion. It’s about what you focus on. Moustafa: I love it! And how does then…or actually what makes if I wanna conclude in one question, cause we talked about passion, about leadership. Moustafa: What makes a passionate leadership or a passionate leader? Arthur: Well okay, a passionate leader. Well, again, I mean, this is, this is not uncommon to the idea of having a vision. Arthur: The leader must have a vision. You have to have some kind of a, a bigger picture that end result, that, that vision! Okay and there’s, there should be some purpose connected to it. Okay? And it’s not just about making money. It’s about doing something bigger than just yourself. Okay? But, but here’s a thing… The leader has to…see, here’s the…oftentimes people expect that a leader must have certain level of competencies. Okay, well here’s a thing…Research has shown that multiple competencies including things that are missing in some, you know, other people have them, and they’re great leaders. People are just like, wow! Okay? They don’t have these competencies and this guy may have it and this guy is like, you know, ahh, doing well. This guy is doing well and this certain guy had none of these and he’s also doing being a great leader. But they’re all different! Why? Okay is it so, so the thing is, people are focus too much on the leadership competencies instead of the development of the individual to become a great leader. See…do you have friends? Arthur: I mean, besides facebook? Right? Moustafa: I’ve had a (laughs). I got a handful. Arthur: So let’s say for example, you go out with your friends. You’re going to behave, your behavior will be different than you have with your family. And your behavior with your friends or your family is also gonna be different than what you have with your… umm, at work. Right? So what ends up happening, is that you literally or your environment is bringing out different facets of who you are. Right? And because that environment is bringing out different facets of who you are, a great leader is one who develops an environment that supports passion, that literally helps people to be from where they are now to who they want to become. Arthur: Right? And so a passionate leader that can, can draw from, oh maybe he’s a good leader with his kids. Maybe he’s not, you know, not, not really that good with the employees. Okay, then maybe he’s good with one of his friends. He’s got some leadership qualities so he bring some from here, from this environment, from this environment, and he identifies the thing that will make him the best of who he is and he creates his own leadership identity. And we actually even have the whole process for this with Directive Communication Psychology. And that is where you develop passionate leaders because they’re not pretending. They actually are being the best of who they are. And just refining who they already are, which means, it’s also a sustainable leadership model. Lot of times people go to these trainings, and they say “Oh you have to have this, you have to be this, you have to do this to be a…” You know, a good leader and everything else, you know, and people tried that and three weeks later…it’s like they just kind of end up going back to how they were because it’s not natural, it’s not really them! Moustafa: Uh it has to come from. It has to come from. Arthur: Exactly! And, and , and having that focus of identifying how whatever it is that you’re doing, whether you’re building pipes, whether you manufacturing phones, whether you are developing people, or whether you’re handling people’s money – it doesn’t matter! Okay? Moustafa: That means a lot of help. Arthur: Their friends. And those people are going to affect others and others and others, and eventually, we will have a better world. Because, we are passionate about who we are and what we’re achieving with each other regardless of our jobs. Moustafa: I love it. Make impact no better way to end this. Moustafa: Be a passionate leader. Thank you very much! Moustafa: What do you think? I would really love to hear your opinion. If you found this useful, share it on social media and let us know your opinion on the blog below. And if you’d like more tools, tips, techniques and exclusive interviews that I only share on my website, go to Moustafa.com. 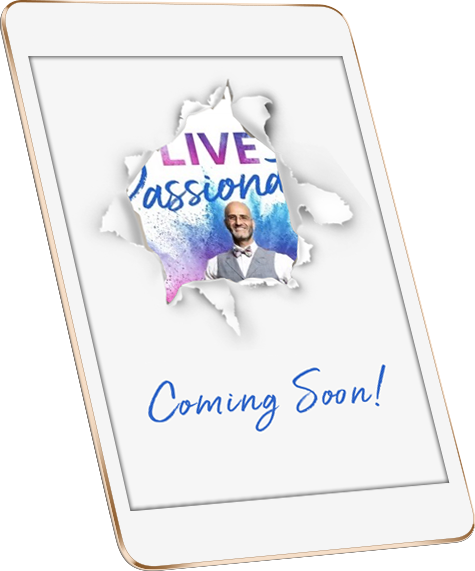 And until next episode, live passionately! And a big thank you goes to Right Selection, the partners for Arthur in the region, if you’d like to book him go to their website.